Remember this picture? Yeah, me either. I've conveniently allowed myself to completely forget about it. This collage of quilt tops, was my declaration at the beginning of the year to bust through my stack of quilt tops and see the year end with a stack of finished quilts. It's now almost September and I haven't touched a single one. On top of that, David and I both have created several more tops that need quilted. I swear, quilt tops are like rabbits, they multiply at an alarming rate. It's time to regroup, get my head back in the game and quilt like a mad woman. So where do I start? Most of these quilts are rather on the big side, so I didn't really want to drag out my Plexiglas and battle my animals for floor space. My alternative? Recreate the quilts in EQ7 to make print outs that I could draw on. So why would I recreate the quilt in EQ7 if I already have the pattern? Recreating a quilt you've already made and have a pattern for in EQ7 is actually a great way to practice using the program. I've been struggling with trying to figure out how to create asymmetrical layouts or even layouts where the sashings are pieced and part of the design (not just mini borders). Doing this has helped me learn about the program and how to use different features and functions. Decisions need to be made to either custom quilt the tops or simply quilt it with an all over design. I have several quilts in a stack that I know I want to quilt with straight lines, wavy lines or some sort of all over filler. First on that list is my recently pieced Have a Jolly Christmas Quilt from Lorna at Sew Fresh Quilts recent QAL. I have backing and batting and hope to load it on the long arm at my cousin's house this week and practice with some wavy lines. As for some of the more custom quilt jobs...expect to see lots of dot to dot designs that incorporate using quilting rulers. I love designs that require very little marking. This is a quilt made from a kit I purchased some years ago. These are mark ups for David's Star Blossom Quilt made from Kona Solids. I really want to do some crazy quilting in this one, so I've tried several different things...as you can see. I can't wait to explore some fun ruler work inside the stars of the Midnight Mystery Quilt, pattern by Cheryl at Meadow Mist Designs. Last night, I was able to start quilting on a recent Meadow Mystery Quilt that David pieced. This is our second commissioned quilt. Though technically it's the first, because we were contacted about it before the baby quilt...the baby quilt was just quicker to make. 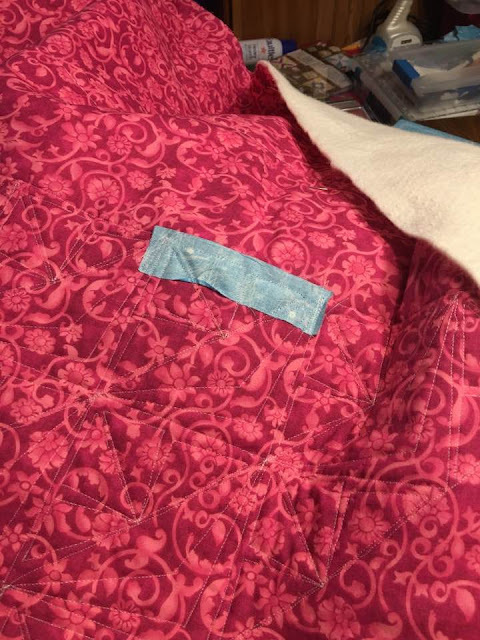 I was impressed and feeling pretty good about how quickly this quilted up using my Handi Quilter quilting ruler. No marking what so ever. Then the curse of the Meadow Mystery quilt struck again! just the laugh of a crazy quilter. Hopefully, this will not become a trend with this quilt. I still have two more Meadow Mysteries to quilt. So for now, it's back to sneaking in time on Jen's quilt, quilting on this one (ignoring the mistake on the back till I feel like fixing it, it's not going anywhere) and continuing to map out plans for the other quilts. I hope you will come back for a visit on Friday to see my latest quilt finish. You have your work cut out for you, chop chop!! I go in streaks where all I want to do is piece one thing after another. That is until the pile gets so big I have to quilt, then I might quilt a ton of them up. It's all good, hehe. I just discovered your blog. I am so excited to follow all your creative ideas. Hope that curse doesn't "stick" with you. HaHa HA. "It's not going anywhere." Oh my, it sure isn't! Maybe by leaving it there for a while, you won't pick up another stray piece as you quilt? Good luck and I hope you really enjoy working through the quilting backlog. They are going to be beautiful! And great idea for using the quilts as ways to become more proficient with EQ7. Oh my gosh Tish...... you have loads going on. Hope you are able to break the curse soon!!! 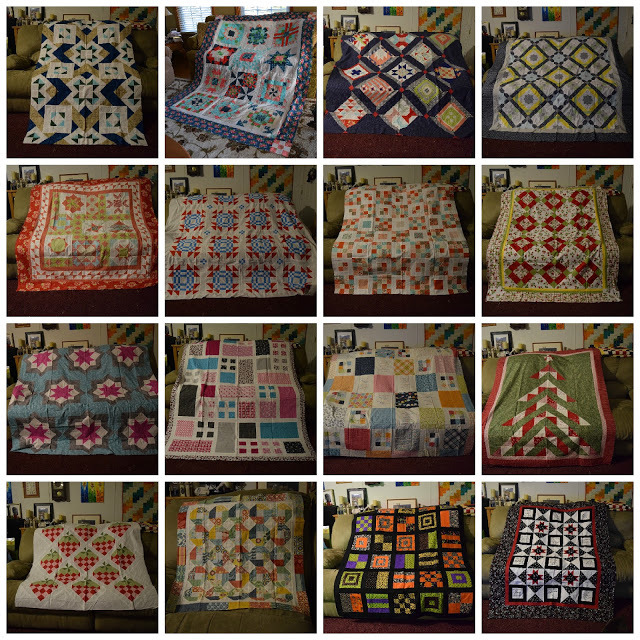 I also have lots of quilts that need to be quilted. I have a stowaway on the back of one of my quilts. It is now a very odd sized, weirdly placed, quilt label. I like the ability to 'map out' my quilting designs on paper beforehand and do print out a pic to use. However using EQ7 to draw up those maps is a great idea to aid in the practice of using the program. Well, at least it's a crazy quilter's laugh this time. I'm not so sure I'd be laughing. In MN, we say UFFDA when stuff like that happens. I'll remember about the curse when it comes to the quilting of the Magnolia Mystery quilt. Hope the rest of your quilting is less scrappy :-) Blame it on the cricket?? I believe I would quilt the one with the Halloween looking colors on the bottom row. Then it would be available for snuggles for the fall! That's a lot of tops. One at a time...one at a time...and then they'll all be done before you know it. Good luck. Tish, your blog is always so fun to read. My goodness, I didn't remember that collage either. That is a LOT of quilt tops! 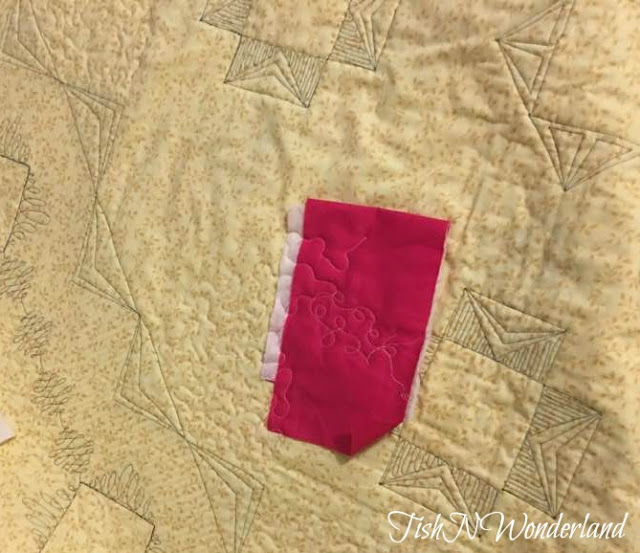 I think your use of EQ7 for trying out quilting ideas is great! I have often wished I had it to audition fabrics but don't know if I would actually take the time to learn it, which would be a shame if I spent the money on it. Do you use that feature quite a bit?